There's no easy way to say this, but your mods trixie_chick and blue_cage will be stepping down, effective immediately, and passing the baton to the new mods, verloren1983 and akira_chan. We have every confidence that they will continue the fun and excitement of deadlines and guessing that is blind go. trixie came on as mod in August of '08, and Pye in February of '11. It's been a tremendous honor and privilege to be caretakers for this great challenge and for this great community. 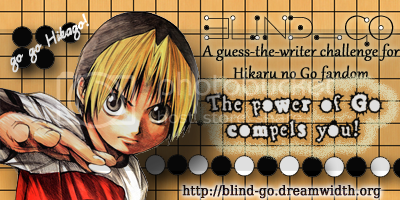 Hikaru no Go is an amazing series, but its fans are every bit as amazing and wonderful. Thank you all for your support and patience over the years, and thank you for continuing to show your love for this series and your enthusiasm for this challenge time and time again!! We hope that you will be gentle with your new mods, heh, and we know this challenge is going to continue for a long, long time to come. And don't worry, we'll still be around... trixie in particular is looking forward to epically failing at guessing for the first time in a loooong time in the next round! Good luck and much love to you all, especially verloren1983 and akira_chan!!! Hello!! A favor to ask of you... as the last bit of "tidying up" for Round 014, the fics will be labelled as to who wrote 'em, and tags will be added for authors. Generally, the tags have been made using the user ID, that is, an individual's livejournal or dreamwidth username, or whatever username was given at sign ups. Especially now that we are bridging between livejournal and dreamwidth, and because the challenge has been ongoing for so long now, I'd like to ask that people check to be sure that the name their fics are being tagged with is the name they want associated with their fiction. People change usernames over time, and maybe now if someone is more active on dreamwidth or on AO3, they would prefer the name associated with that account to be used for the tags. Though, keep in mind, the dreamwidth tag list links only lead to the list of fics from previous rounds on the dreamwidth account. IF you would like your tags changed, please comment here to let us know!! Otherwise, when your entry for Round 014 is labelled and tagged, your username given for the round will be used. For simplicity's sake, we'd prefer the tags be as seamless as possible, but it's ultimately your name, so... we wanna get it right! Thank you to everyone for such a great round! Congratulations to tuulentupa / tuuli_chan with 7 correct out of a possible 11 (63.64%)! Honorable mention to rex_sun and roguemariel , with 4 correct out of 11 possible (36.36%). Congratulations to chagrined, who correctly guessed that this round's IDs were Famous People Born on September 20th! Great job! Congratulations to love / aiwritingfic, phnx, and qem_chibati who all commented to all the fics (save their own)! Honorable mention to tuulentupa / tuuli_chan, who commented to 10 fics! Congratulations to rex_sun for winning the Theme Challenge! Honorable mentions goes to kexing! 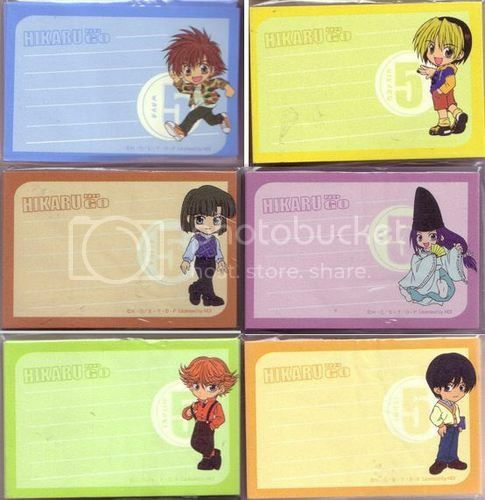 For this round, as a special treat, winners will receive a Hikaru no Go notepad!!! Your choices are shown here; winners should contact trixie (PM on LJ, PM on DW, ask on tumblr, or email) with your top three choices of characters and a mailing address. You will be notified when the notepad ships. Congrats!! ONCE AGAIN, THANK YOU to all participants, whether through writing, reading, commenting, cheering, chatting... See you soon!! Here it is, the ID Challenge post!! Be the first to comment to this post with the answer to the theme connecting the author IDs here. First correct guess wins! One guess per person and no edits are allowed. Only guesses on this post count for the ID challenge. Also, there's still PLENTY of time to guess the authors! You have until 11:59pm ET for guesses... and comments! I know all our authors would love to hear your thoughts, so if you haven't commented yet, check out answer_key!! Leave your guesses as a comment to these posts for a chance to win! Guessing and commenting are still up for grabs, so get readin' and get active! Look forward to the reveal later! Anon commenting is now enabled for fics; many, many apologies for that error. Happy Birthday, Hikaru!! We can think of a few things he'd want for his birthday, but what we want for his birthday is lots of fandom joy, so it's time to revel in the joy that is fic!! For Round 014, we have 19 fics from 12 authors!! Without further ado....! The deadline for guessing is September 29th, 11:59pm ET. Please be sure to check that you're guessing writers who have actually submitted fics for this round; we've had incidents in the past where people have guessed writers who didn't submit. Remember, you are encouraged to constructively comment to fics - anonymously, and with your author IDs. In fact, the authors are really hoping you will!! ⇒ if your name appears or does not appear on the author's list in error. ⇒ if there are any mistakes in the links to the fics, or if there is a typo or other small correction in your fic that you would like changed. ⇒ with the names of people who are not allowed to guess for your fic (e.g. betas, friends whom you've discussed it with, people whom you've verified your ID for in facilitation of your own guessing post, etc.). The deadline for submissions for Round 014 of Blind Go is now officially passed. Thank you to all participants, and look forward to the posting momentarily!